During a riot at San Quentin, it's every man for himself. And then there's the soprano. Survival becomes this song-bird’s sole focus. Snatched from the chapel by an inmate, Livvy doesn’t know who to trust. Tobin says he’s protecting her, but she’s been blindsided before. 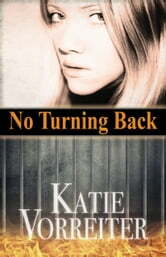 She struggles to put her trust in God, while all too aware that free will can wreak horrible consequences. Tobin wants her to hide and ride out the prison storm, but Livvy becomes the obsession of another inmate who’s a serial killer. Will God protect her? Will Tobin?